NEW YORK (TheStreet) -- Here's food for thought: Houston's Sysco (SYY - Get Report) is the largest food-service distributor in North America, serving 425,000 customers products from seafood and dairy, to sanitation maintenance and glassware. I believe Sysco is a very strong company but I have little insight into the current share prospects. Especially in the short term it can often be much easier to predict general business results rather than exact share price oscillations. Instead, I like to come up with a range of reasonableness to determine the present outlook for a firm. Its shares recently traded near $37.75 and are up 4.6% for the year to date. According to Morningstar analyst Erin Lash, since 1969 Sysco has acquired more than 150 companies or divisions of companies to expand its footprint, most recently a deal to acquire U.S. Foods, the second-largest player. It's clear that Sysco is growing via expansion. This latest addition would bump the company's combined control of the North American food-service distribution market up to 30% -- serving nearly one out of every three customers. On the good yield front this is also relatively easy to observe. 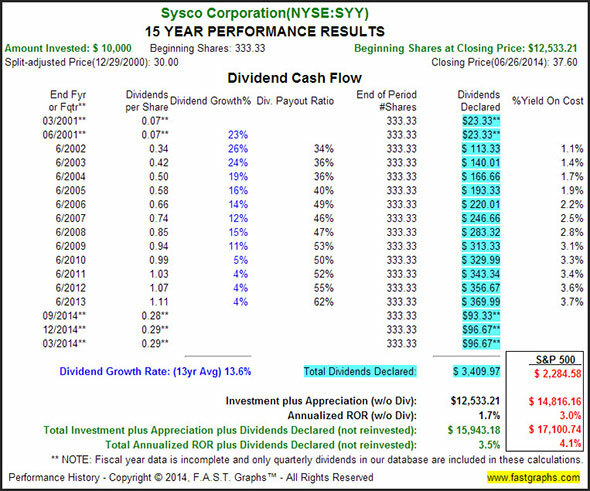 Sysco has a quarterly payout of 29 cents for an annualized yield of 3.1%, fully 1% higher than the average company. Finally, it may or may not be true that shares are heading higher; it largely depends on the timeframe one is anticipating. As mentioned, I make no such claims as to having special insight in this area. However, we can look to history as a guide along with reasonable expectations moving forward. To illustrate this point, I will use the fundamentals analyzer software tool of F.A.S.T. Graphs. Below I have included the 15-year chart of earnings and price correlation. 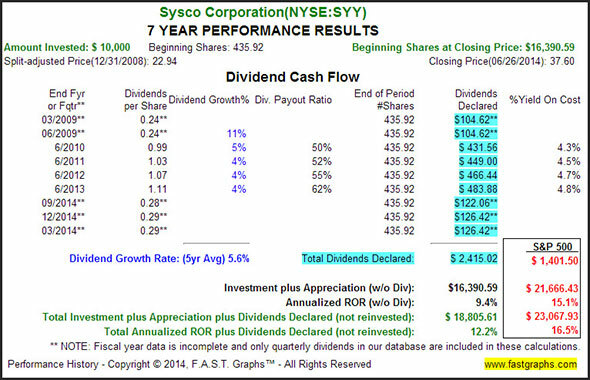 Note that Sysco's operating earnings grew by about 7% per year, dividends increased steadily and shares generally traded at a bit of a premium with a normal P/E of 21.4 during this time. Further, it's important to point out that shares were trading at about 40 times earnings at the beginning of this period as compared to a P/E ratio of about 21 today. As such, we can observe the corresponding performance results. While the business results increased by over 7% per year, the price only appreciated by about 3.5% during this time a direct result of the compressed price-to-earnings ratio. 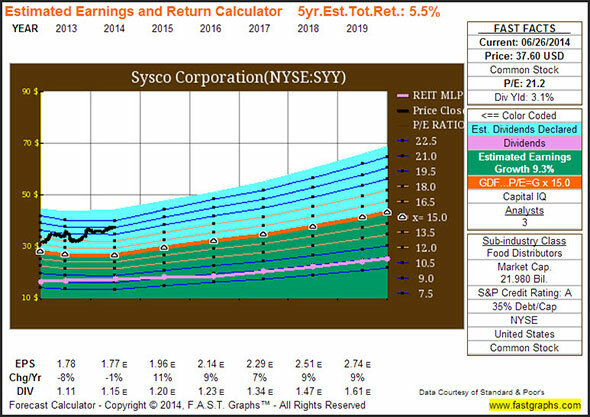 Interestingly, despite the low starting yield, Sysco still provided more income than the S&P 500 index. If we take a more recent picture, the dynamic nature of the tool takes form. More specifically, since the beginning of 2009, shares of Sysco have exchanged hands at a normal P/E of about 15 as compared to 21 since 2000. Clearly the P/E ratio has been lower in recent history. Note that operating earnings only grew by about 2% per annum during this time. However, we can also see that shares went from a P/E of about 12 to today's previously specified 21. As such, an investor would have seen the share price accelerate much faster than the actual growth of this company during the more recent time frame. If we look at the performance table below, we can see that the share price increased by nearly 10% per year this despite the idea that the business only grew by about 2% annually. What a difference buying at solid valuations can make. Thus, on a forward-looking basis the potential investor of today would likely want to get a handle of how they felt about the earnings multiple moving forward (in addition to the necessary first step of determining the viability and growth prospects of the business). 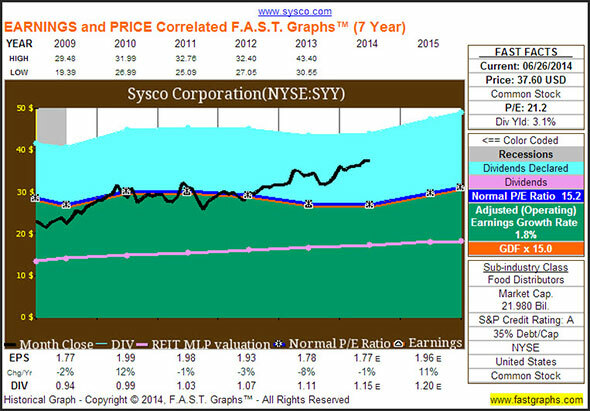 For instance, I demonstrated that Sysco had a normal P/E of about 21 over the last 15 years. Yet, consider that this ratio varied dramatically ranging from a high around 40, to a low of nearly 12 back into the mid-range at 21. Since the end of 2008, shares of Sysco have had an average P/E ratio of about 15. Considering that the higher P/Es were generally reflective of higher growth rates it might be prudent to scale back one's expectations. In other words, it is true that the normal P/E since the turn of the century has been 21 and that is the current P/E. Yet, of late an earnings multiple of 21 has been higher than average. Here's the bottom line. If you're an investor looking at shares today trading around 21 times earnings and you expect 21 to be a fair multiple in the future, then your performance results will likely follow business results over the long term. If you expect that 21 is too high a multiple and sometime in the future it will be lower, then your performance results might trail business results over the long term. Of course, if you expected a higher multiple, then performance results could outgain business results as was the occasion in the last five years. At least historically speaking, there hasn't been much evidence for the last possibility. As I believe it's prudent to consider an investment from a wide range of possibilities, I would like to conclude by demonstrating the potential performance prospects moving forward with a lower P/E ratio. The Estimated Earnings and Return Calculator below presents the median estimates among analysts reporting to S&P Capital IQ. Analysts are expecting a long-term growth rate of about 9%. If the earnings materialize as forecast, and Sysco trades at a 15 P/E multiple in the future, this might indicate total return results of 5.4% per year. Now, it's paramount to underscore the idea that this is simply a calculator, but it does provide a solid baseline for how analysts are presently viewing this company. Overall, I believe that Sysco is a solid company with reasonable prospects moving forward. However, shares are presently trading a bit higher in valuation than they have in the past five years or so. Granted, shares could still make a compelling investment if investors are willing to pay 20+ times earnings. Yet, in the case of prudence, caution might still be the word. If you're using the phrase "shares could go higher" in the sense of five years in the future then there's a reasonable chance of that happening. Simply keep in mind that you might face the risk of the share price growing at a slower rate than business results. As always, I recommend that the reader conduct his or her own thorough due diligence. At the time of publication the author was long SYY. 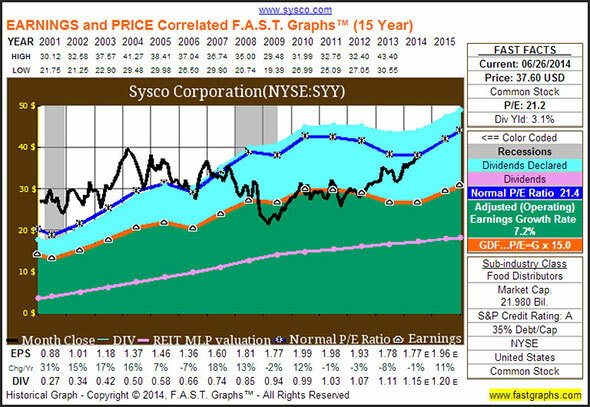 "We rate SYSCO CORP (SYY) a BUY. This is based on the convergence of positive investment measures, which should help this stock outperform the majority of stocks that we rate. The company's strengths can be seen in multiple areas, such as its revenue growth, good cash flow from operations, largely solid financial position with reasonable debt levels by most measures, increase in stock price during the past year and notable return on equity. We feel these strengths outweigh the fact that the company has had sub par growth in net income." SYY's revenue growth has slightly outpaced the industry average of 5.5%. Since the same quarter one year prior, revenues slightly increased by 3.2%. This growth in revenue does not appear to have trickled down to the company's bottom line, displayed by a decline in earnings per share. Net operating cash flow has slightly increased to $389.90 million or 4.63% when compared to the same quarter last year. Despite an increase in cash flow, SYSCO CORP's average is still marginally south of the industry average growth rate of 11.91%. SYSCO CORP's earnings per share declined by 8.8% in the most recent quarter compared to the same quarter a year ago. The company has suffered a declining pattern of earnings per share over the past two years. However, we anticipate this trend to reverse over the coming year. During the past fiscal year, SYSCO CORP reported lower earnings of $1.68 versus $1.91 in the prior year. This year, the market expects an improvement in earnings ($1.77 versus $1.68). Despite currently having a low debt-to-equity ratio of 0.59, it is higher than that of the industry average, inferring that management of debt levels may need to be evaluated further. Regardless of the somewhat mixed results with the debt-to-equity ratio, the company's quick ratio of 0.98 is weak. The company's current return on equity has slightly decreased from the same quarter one year prior. This implies a minor weakness in the organization. Compared to other companies in the Food & Staples Retailing industry and the overall market, SYSCO CORP's return on equity exceeds that of both the industry average and the S&P 500.